Thailand, bordering several countries has evolved a comprehensive cuisine that is varied and spicy. It gives the liberty to choose from an array of different dishes. Generally, Thai recipes are light and spicy and not ruined by eating out at a Thai restaurant. There are people who may have concerns about spiciness as chili is pervasive in Thai cuisine. Thai food often comes in hot flavors. The menu of a Thai restaurant will attest to that. There is a common misconception that Thai recipes are all curry and chili, but the reality is that sweet, sour, salty and spicy are evenly used in the same meal or in a course of meals. It is a balancing act if you are a vegetarian to ensure no specific meat dish or meal contains either meat or fish exclusively. In Thai food there is a huge focus on fresh ingredients. Thai curries feature fresh vegetables in a broth of coconut milk with galangal leaves, basil and lemongrass. Often the fresh, zesty curry will have a shot of heat powered by the chilies which are seared in the wok before the curry is grounded with other spices to form a curry paste. 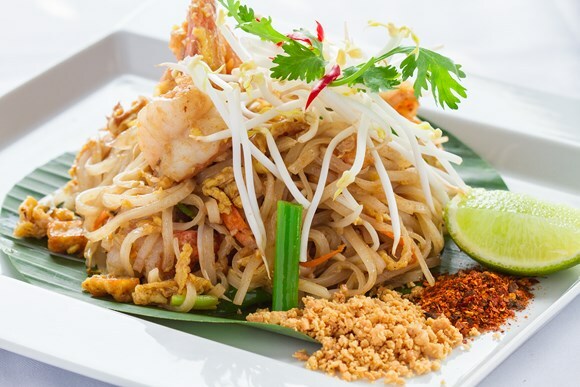 It is the heat of Thai food that adds to the experience and exotic flavor. Many Thais believe that hot food is beneficial to health. They say it can clear out the sinuses; heat is an element in traditional Chinese medicine. Too much heat can be unhealthy, however heat can correct systemic health problems emanating from an excess of cold. Chilies boost the immune system and fight off illness and can improve cardiovascular health. Whenever you visit any Thai restaurant you should know how to select the healthiest Thai food without ruining your diet. Thai food is usually accompanied with a sauce. The dish phrik nam pla comprises of sauce made out of fish, chilies, garlic and flavored with lime juice. Thai recipes can differ from family to family and also from restaurant to restaurant. But Nam pla is unique thanks to its strong taste and aromatic fish sauce, it is very spicy. Thai noodles are made from rice wheat and egg as a single dish with stir fried meat and vegetables found in soup. Chinese dishes are adapted to Thai-taste with more spicy and hot flavors. Certain insects are also eaten in Thailand, mostly in the Northern regions. They are deep fried and made to taste like bland seafood after adding a few spices to make them great snacks. If you are feeling appalled at the thought of eating insects or very hot food you can ask the server to make amends to the courses and serve them without these ingredients. Hospitality is a great virtue of Thai people and Thai families. So if you find something very uncomfortable in a restaurant, speak up and they will be glad to fix it. Never drink water to soothe chili as it will only increase the burning sensation. Milk and sugar work well to relieve the spice content if it is too high.